A Bunny birthday party has to have bunnies. Now, you wouldn't believe the number of people who suggested that we rent/hire/somehow obtain live bunnies for the children to play with. 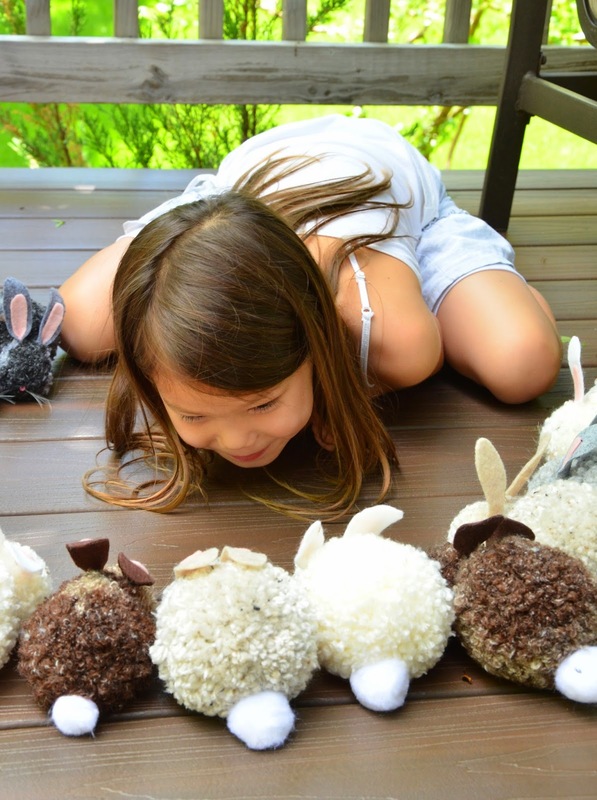 Nothing against live bunnies (unless they eat the plants in our yard) but I thought that surely, surely, we could do more with a Bunny party theme than go the petting zoo direction. So fake bunnies, then. I'd considered the sewn version - you know, fabric bunny softies. After all, I know at least one somewhat cute version. But mass-sewing softies is a lot of work, and besides, we already have eight of those baby bunnies at home. So I picked the no-sew, yarn pompom alternative. And here I feel a Nostalgia Attack coming on. 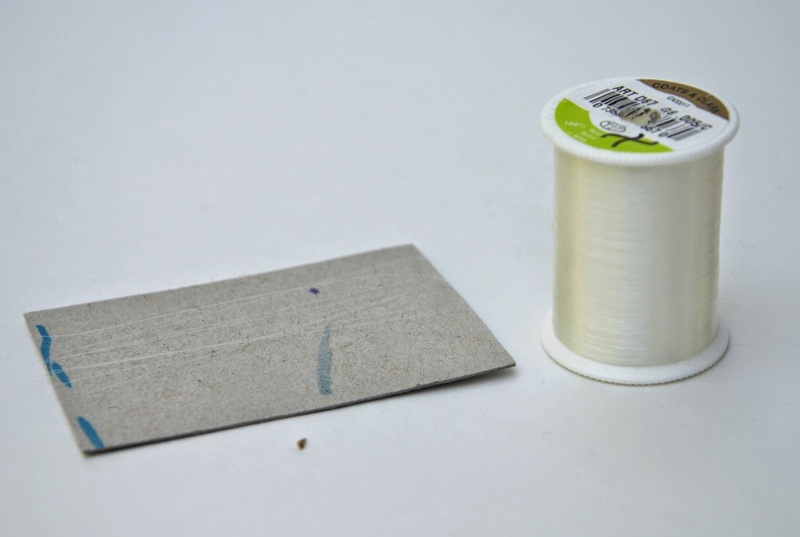 Let me tell you a Story-From-My-Crafting-Childhood, okay? Not like you have a choice, anyway. We wound our forms (in two sizes), tied their middles, cut them out and trimmed them to shape. 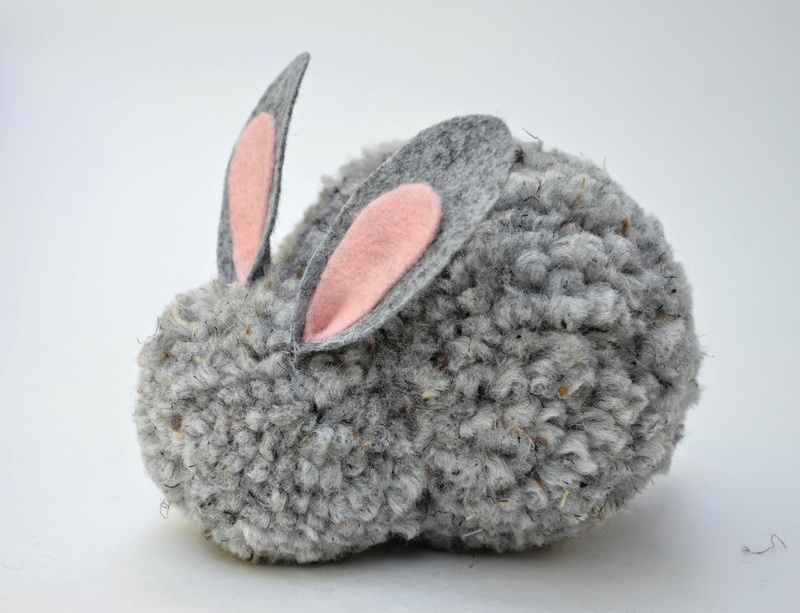 We tied a large and small pompom together to make the bunny's body and head, respectively. This is how big ours was. Q1: How big are the pompoms you used for the body and head? A: I do not remember the exact dimensions of the pompoms we made, but the body was roughly 4" and the head 2" in diameter. Q2: How did you attach the body to the head? 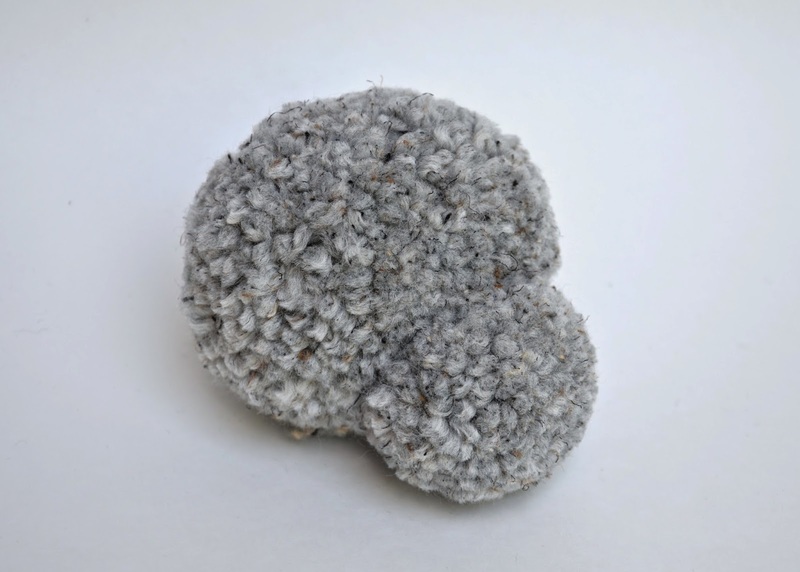 A: When we made the pompoms, we left the trailing piece of yarn uncut (this was the piece we used to tie the middles of the pompom circles tightly) for both the head and body pompoms. We had a double strand for the head and a double strand for the body. Then we knotted these two sets of yarn strands together, tightly, and bound the head and body together. We did not need glue. 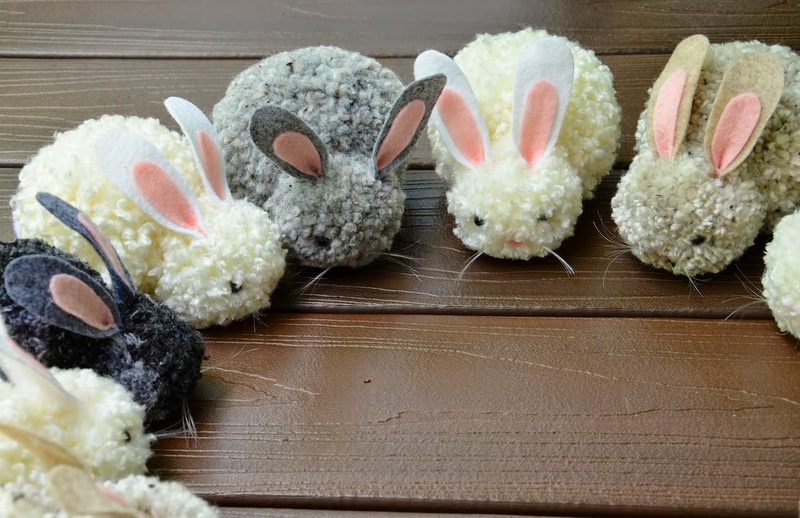 We made bunnies in different colors. before inserting them into the heads. regardless of the color of the bunny. The bunny is now ready for its face. but we glued ours on. and glued it in place on the bunny's face. 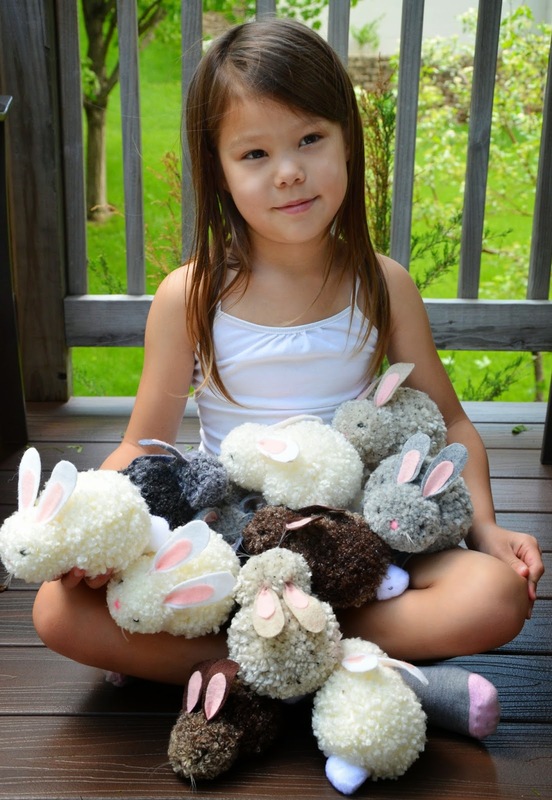 Kate loved watching the bunnies come together as we made them. Here she is getting to know them before the big day. 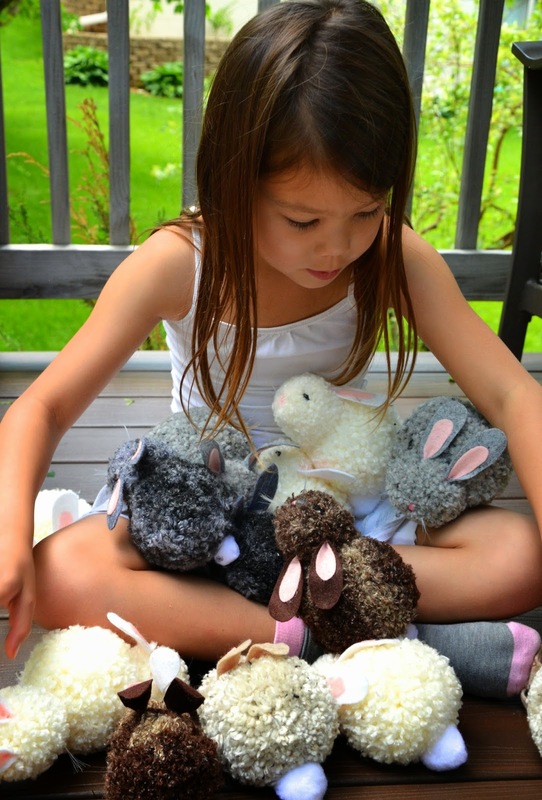 Your bunnies are so adorable, and I LOVE those pics of Kate with them! It's also very neat that you have those special memories with your grandmother! Yes - these are so cute! 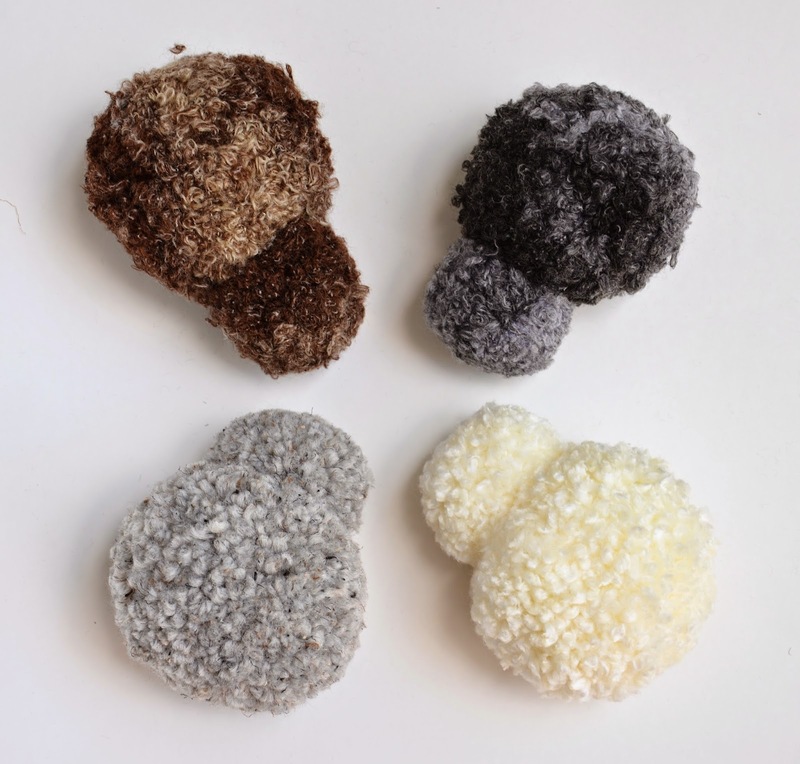 Where did you find your pom pom makers? Would love to do these with grand-daughters! Loved reading about the bizarre chick family and the memories of your grandmother. 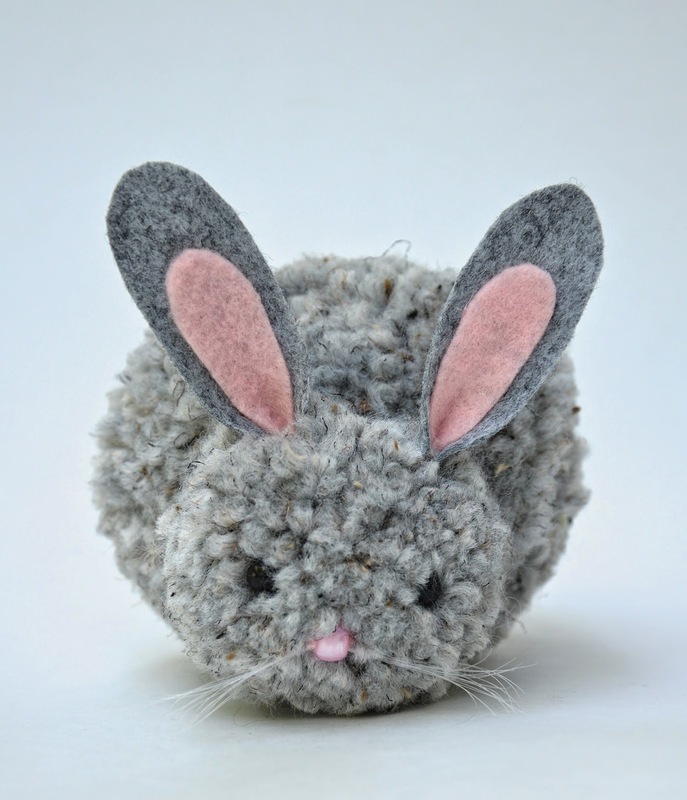 And I love these pompom bunnies. These are so cute!!! I need to work on my pom pom making skills (I suspect I don't use enough yarn - or I should try thicker yarn). These are too awesome! 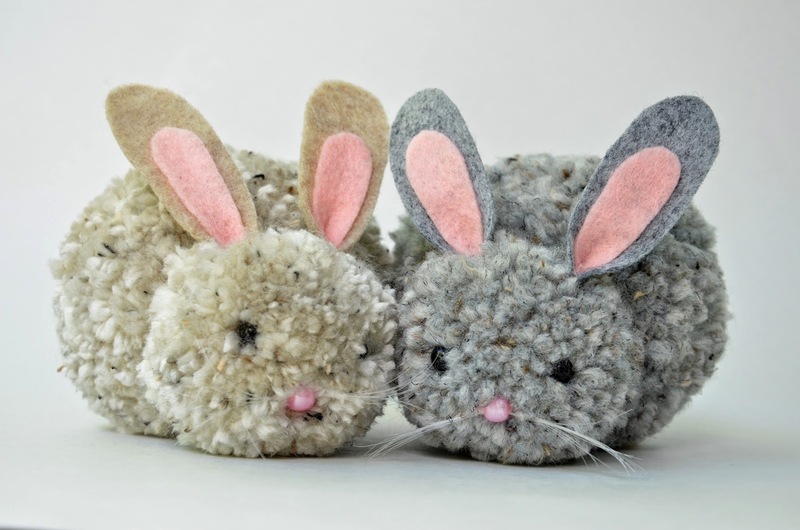 I am going to make these next week at the cottage with my son, he loves bunnies! Looking forward to the hutch installment. The last couple of photos reminded me of the infamous Star Trek Tribble Scene. Wow! 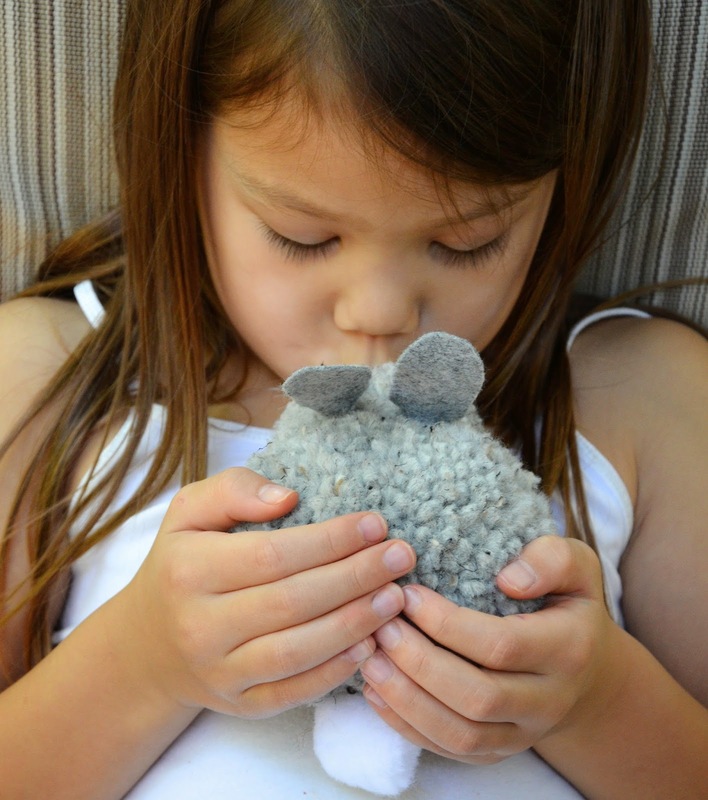 These are so cute and I'd love to try making them with my kids. Out of curiosity, approximately what size pom poms did you make for the head and for the body? 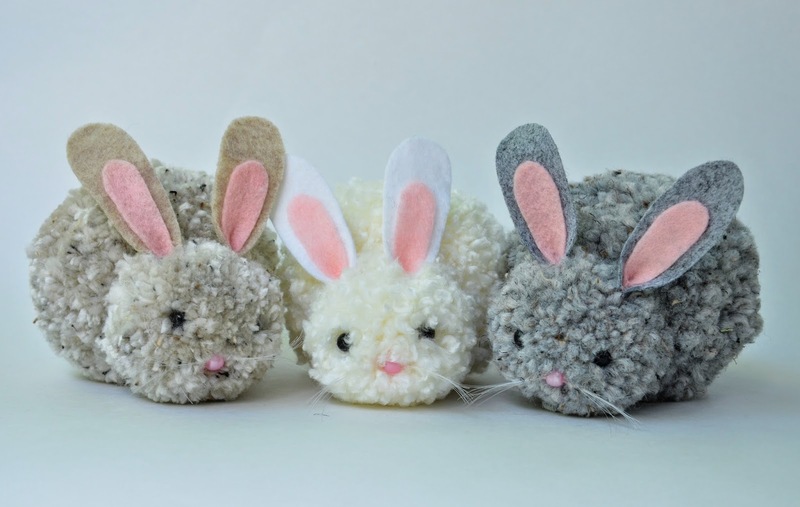 your pom pom bunnies are adorable and my granddaughters will love them - heck I think I will make them for my grandsons too. thanks for the excellent tutorial. Wow! I haven't seen these since I was a small child & that's been a few days ago, believe me! Just as cute now as they were then- the only difference I see in them are their noses. 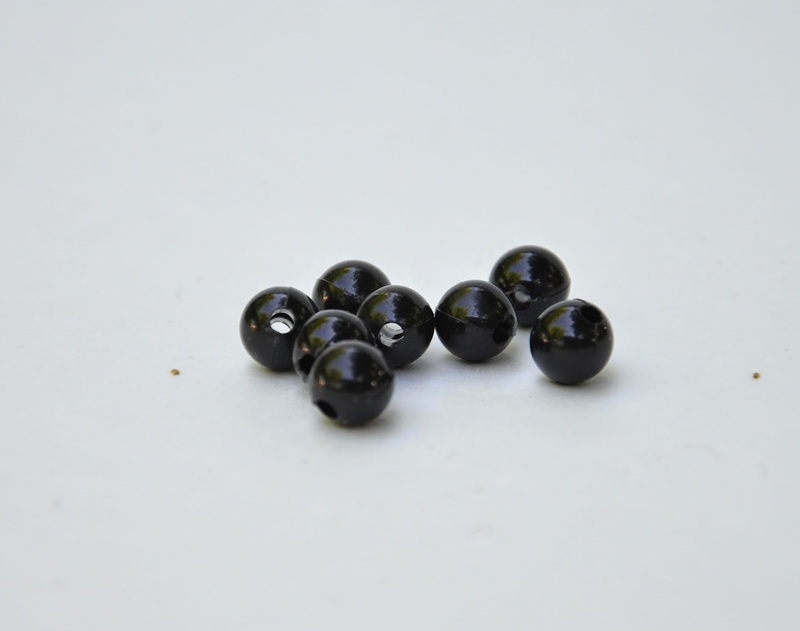 It seems like they were a piece of plastic like an artificial holly berry :-) I think I'll make a few just for the memories! About how long are your bunny ears. I am planning on making them for the kids in my church . I used to make these with my grandma. She was born in 1910. I will make them again this year and smile... Thank you! I just made 8 of them this weekend for some friend's kids I babysitted yesterday. Both girls had a blast. I made 4 adult and 4 babies... with cardboard houses and paper food because I learned from your daughters that softies ALWAYS need food and shelter. Thanks for the project! These are adorable! 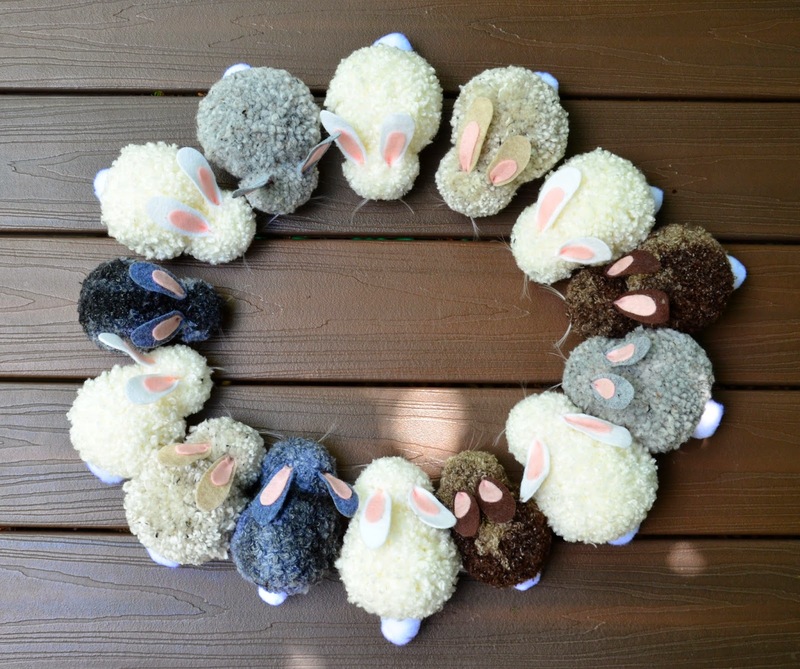 I would love to make them this summer with my day care kids and have a theme of the week "bunnies"! My problem is, I don't know how to make the pom poms and how to attach the head and body! 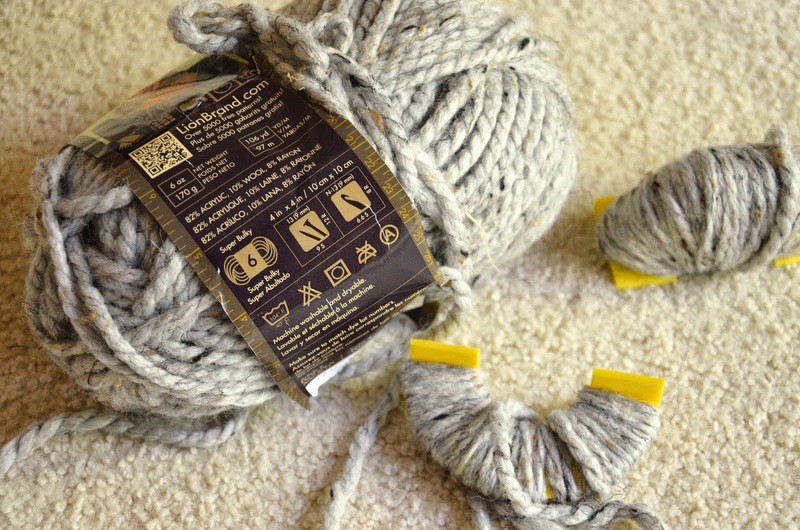 Do you make a cardboard template to wrap the yarn around? How big would you make the cardboard and how many times do you wrap the yarn around for body and head? 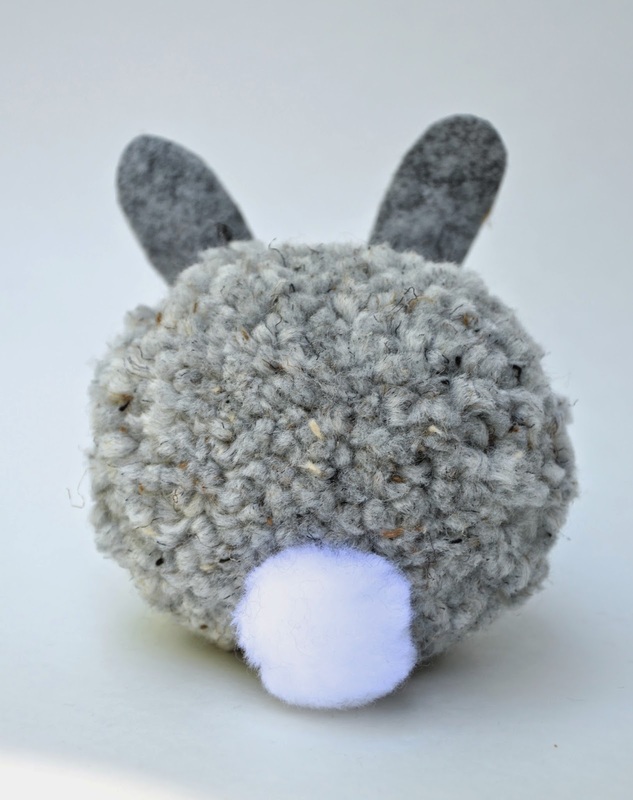 Do you have pictures of the steps to make the pom poms and attaching them together? if so, I would really appreciate seeing them. Thanks!!!! The little houses are adorable too! Do you have a pattern for the pieces or sizes to cut the pieces? 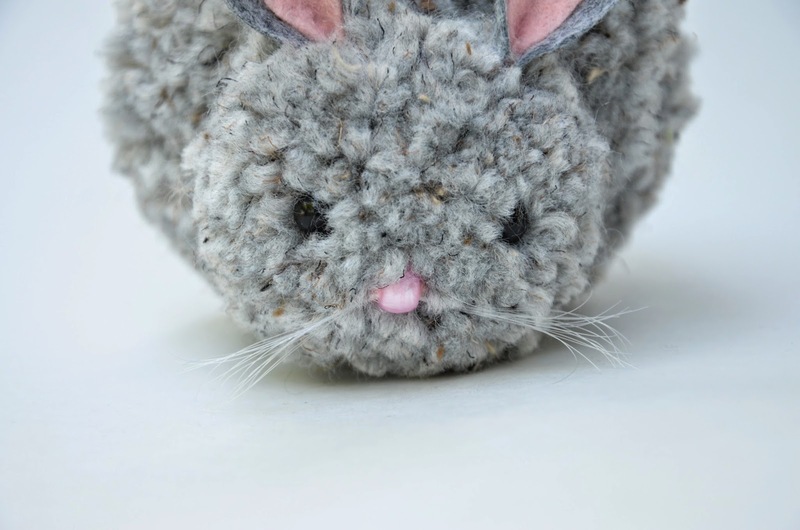 These are lovely, but how do you attach the ears to the head? 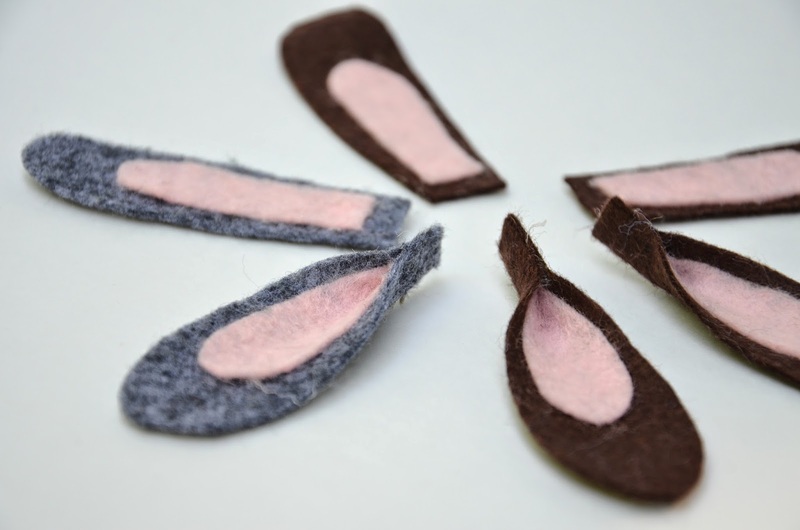 I, too, like Anonymous above would like to know how you attach the ears - do you glue them, sew them??? Also, do you have a template for the ears?? Would much appreciate if you could post one. I'm sure a lot of others would like that too. Many tks for your help. I do so love these adorable bunnies. Too cute for words! Many tks for sharing! Gogran97 and Anonymous(above): I use glue. Apply glue to the bottom end of the ear and, on the spot where the ears will go, part the yarn and insert the ears about 1/2" deep into the part. Press the yarn together around the ear bottoms till the glue sets. 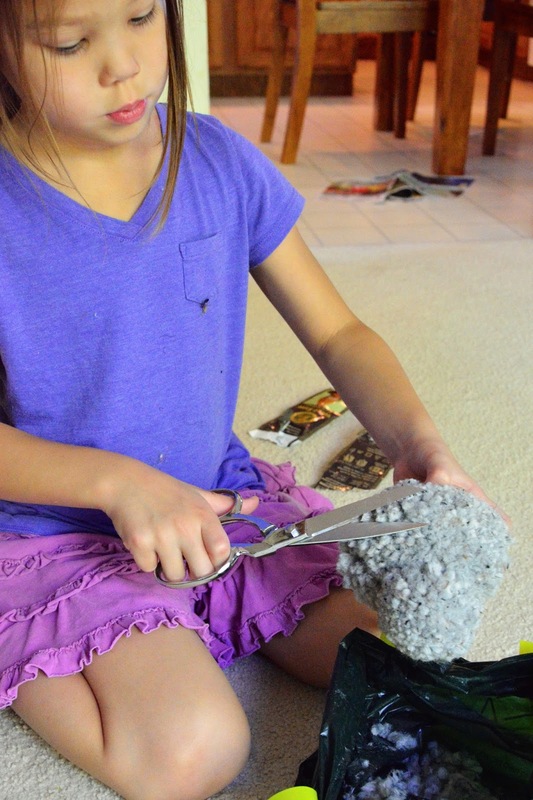 I use UHU glue, which sets fast. Tacky glue would work, too. Avoid Elmer's white /clear glue at all costs- does not work. can you go into more detail about the forms part? Where do you get the forms? Then you wrap them, but how do you take them off. How do they end up fluffy. I got lost there. Thanks! Mary: I bought the forms several decades ago. I think Clover has similar ones, also plastic that you can buy in the US or online. The instructions will tell you how to use them. 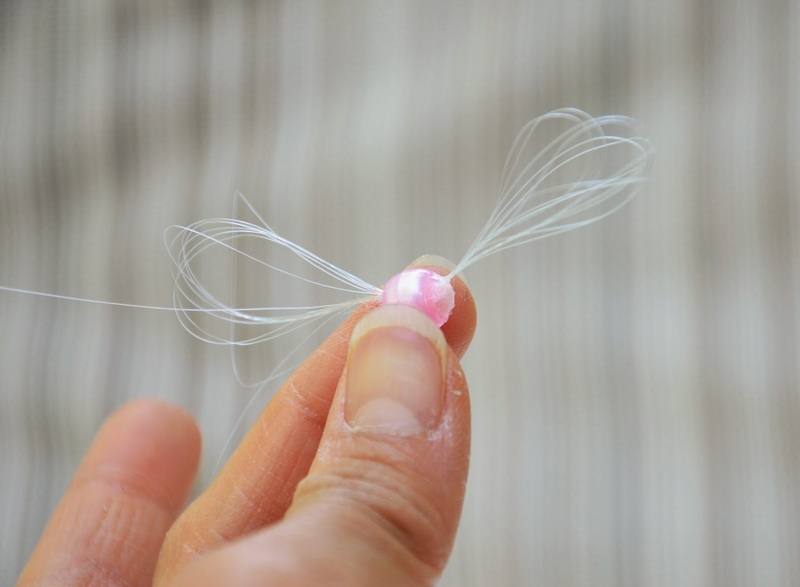 Essentially, the yarn is wound tightly around the forms so they are compressed in volume. When they are released from the forms, they fluff up naturally. Where did you find the black beads for the eyes? I want mine to look just like the ones you made, or as close as I can get. They are very cute! Thanks. Brittany: I don't remember! They might have been Darice beads, from Michaels the Craft Store. 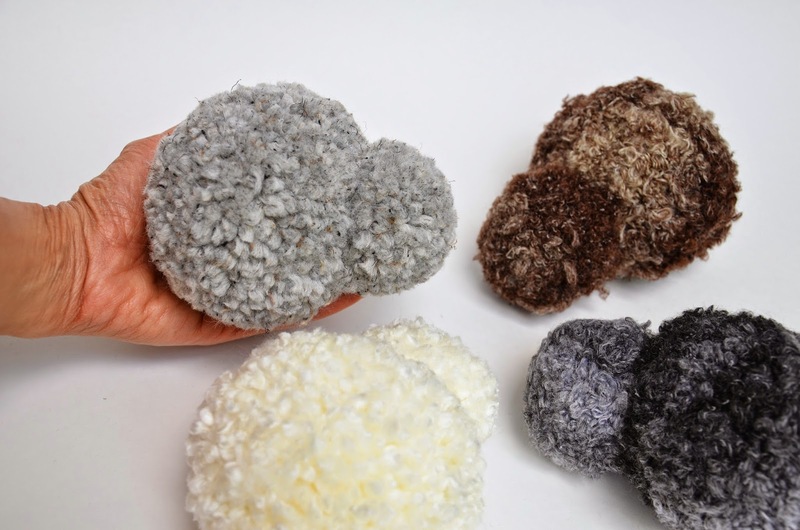 One more question, what size pom pom makers did you use? I bought the clover ones. They are large, medium, small, extra small. I coniglietti sono bellissimi!! !grazie per aver condiviso questa stupenda idea da realizzare con e per i bambini,la farò sicuramente per Pasqua!!! What adorable little bunnies. I want to try and make a couple as I love things like that. Nice job. Post meraviglioso!!!!! !Piacere di conoscerti!Sono felice di proporre questi conigli ai miei alunni di prima elementare per la Pasqua(60 conigli in tutto!!!! ).Ti citerò nel mio blog per la stupenda idea.GRAZIE!!! First of all, your kiddo is such a cutie patootie! Second of all, these bunnies are so stinking adorable! 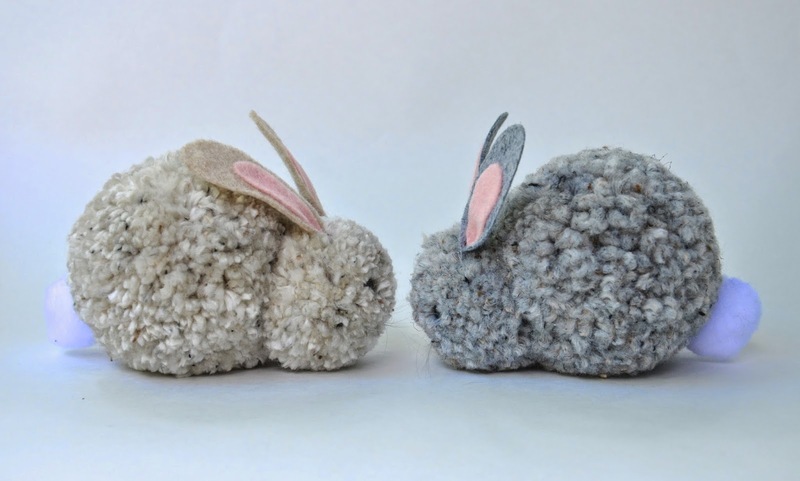 This is creativity at its best.Can you kindly email me easy steps on how to make these bunnies ? How do you connect the two POM's together??? When you make the pompoms and tie their middles with yarn, don't trim the yarn - leave the ties long and then tie them together. I do not glue the head and body pompoms together - tying alone is sufficient. Thank you so much for this inspiring post! Those bunnies are too cute!! Hi, not sure if you're aware, but i found this post through Pinterest, which linked to a site called Wonderfuldiy.com. Both sites had photos of your little girl with the bunnies. Thought I'd mention it. Feel free to not publish this comment, it's just for your info. Thanks, Jo. And I did publish the comment because I have seen those photos of Kate all over the internet in the past month. Much as I'd love to police these sites, I'm going to let it go, or it would never end. I do very much appreciate your comment, though, and am leaving it here in the hopes that other folks will see it and be aware of what I prefer and disprefer when it comes to pinning. Thank you! Oh my these are the cutest little bunnies ever! Can't wait to make a few. Such a darling tutorial! Thank you! I was inspired to make them and photograph them for my blog as well. I linked back to you as my original inspiration, because your tutorial is so well written. 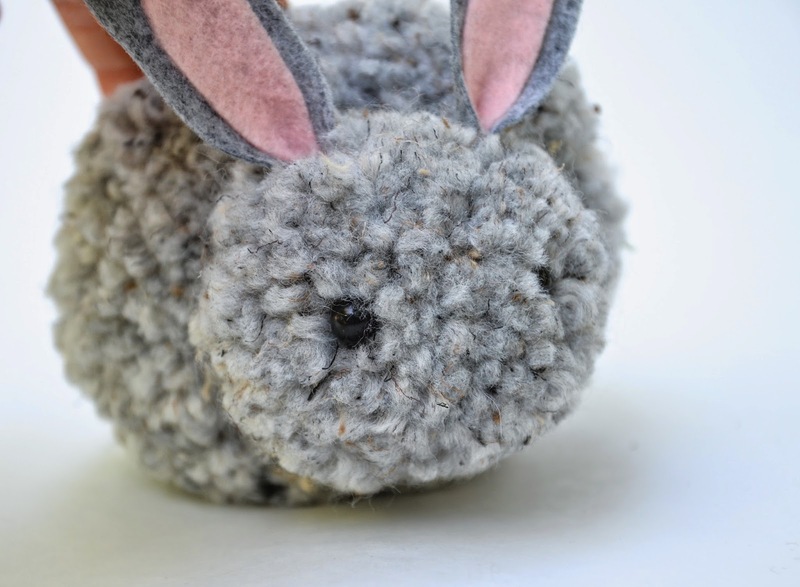 I have made about 17 of these bunnies and I am so thrilled with how they have turned out! Everyone wants one (or more)! Thank you for the instructions!! I have made several and everyone loves them!! I dont think you ever actually said. Did you simply glue the bunny ears to the bunny once they were made? Me encantó la historia y los conejitos. Gracias por el tutorial. 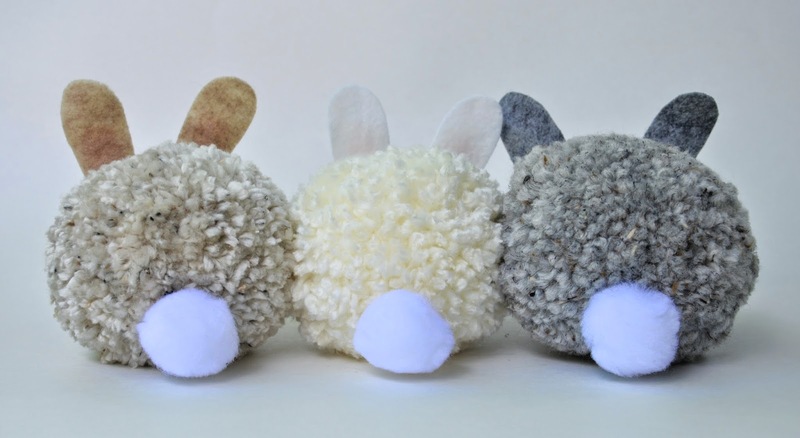 My mother and I made these and many other pompon animals in the 60s for my infant schools' summer fete toy stall and Christmas bazaars, so this was a real blast from the past! 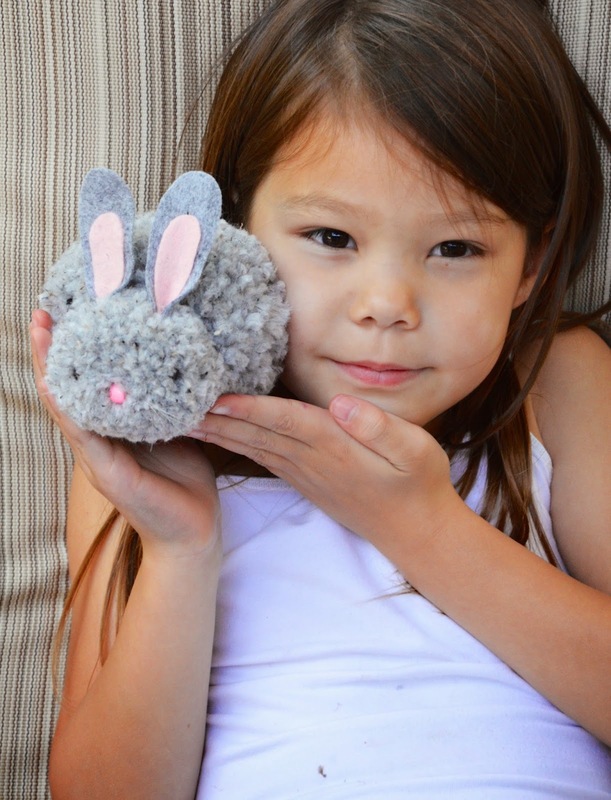 Naturally, I taught my children to make pompon pets in the 80s and 90s. 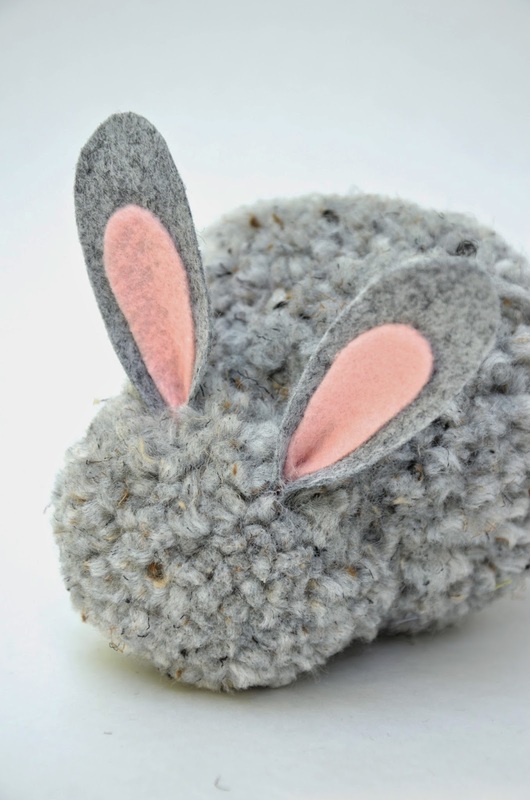 Incidentally, my mother was taught pompon making (among many other crafts) by her aunts and grandmother in the 1930/40s and I am so glad she passed this creative urge to me. son hermosos y muy tiernos yo hice pero no me salieron igual. Please feel free to contact us if you want to add something about your blog. P.s. 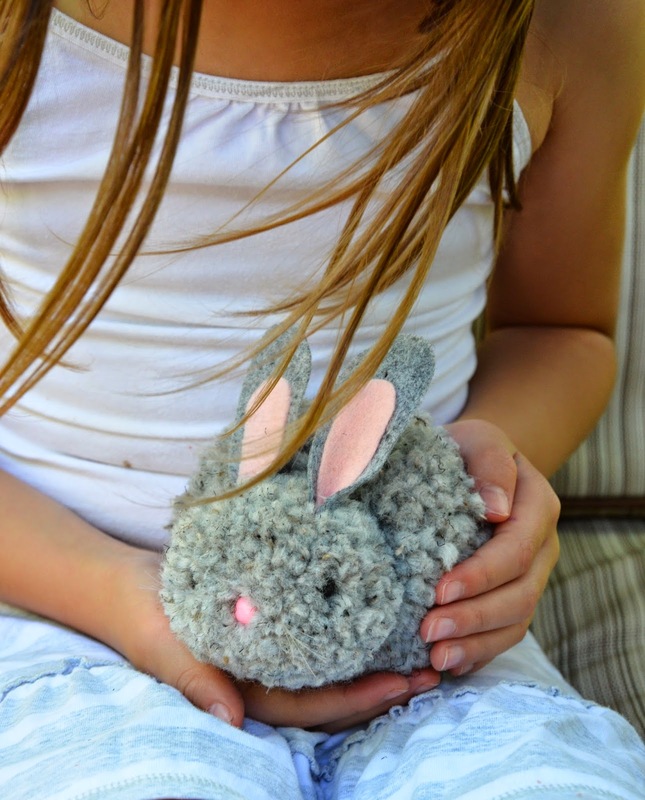 Adding this project to my to-do-list as my nieces would love to have cute bunnies for sure! leaving: I did not use the Clover brand. Mine was a set from several decades ago, which had 4 sizes. I think mine was about 4" for the body and 2" for the head. Thank you so much for this great bunnies. My boys and me really love them and made them. The are wonderfull and easy to make. 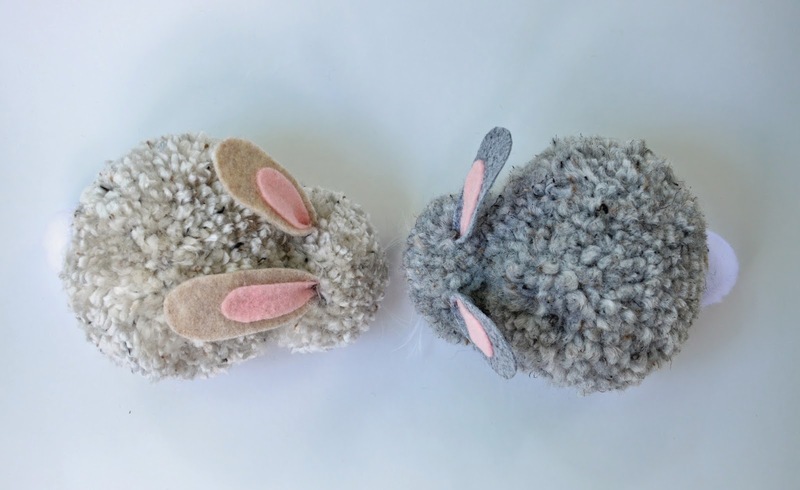 I have fallen in love with your bunnies----------I work 2 jobs and I am all thumbs when it comes to crafts----would you consider making and selling? 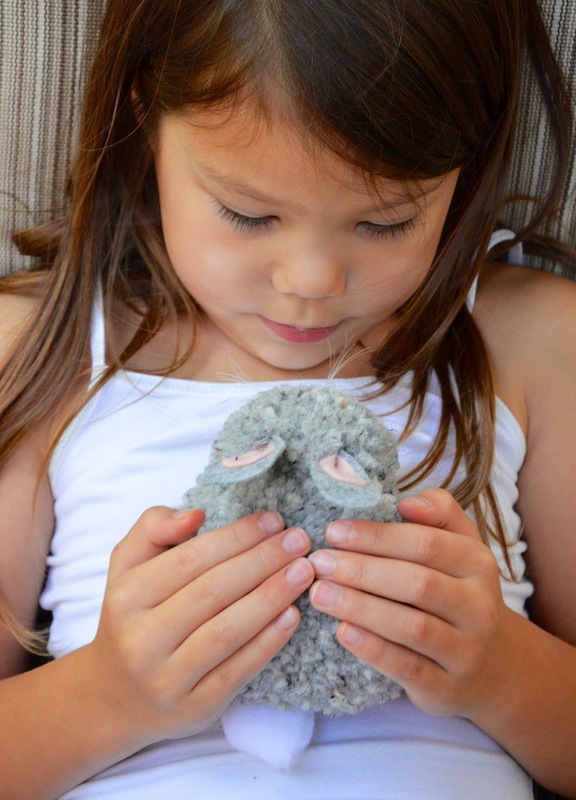 Our girls love the bunnies we made, thanks to you! I gasped when you mentioned the Golden Dragon because we lived in SG for a number of years and both our girls were born there (in SG, not in the Golden Dragon). It was THE place to go for sewing and crafts and one of my favorite haunts until we moved back to the US. Thanks for the tutorial and for bringing back some happy memories from our time in Singapore! what size beads for the eyes and nose? Mimi: we used beads we already had in our plastic jewelry beading stash, so this is an estimate at best. 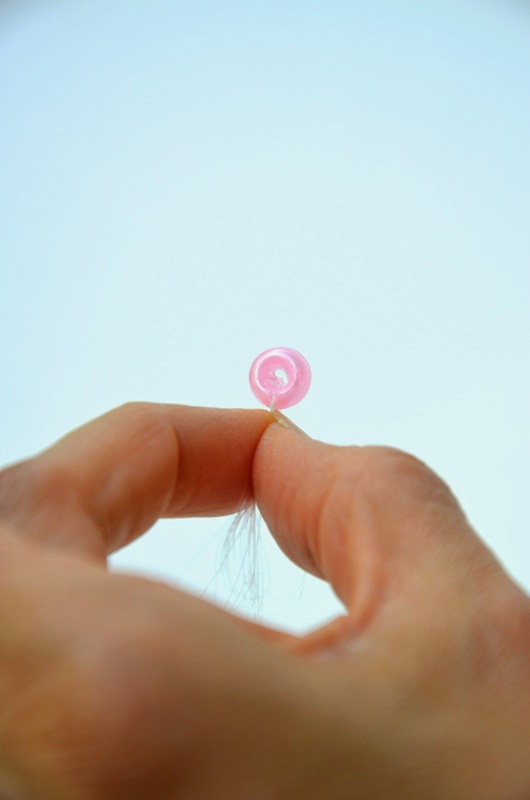 The pink beads for the nose were larger pony beads, but both those and the eye beads were about 1/4" in diameter for bunnies of the size we made. This gonna be my next DIY project. It gonna be so much fun. I see how old this post is, but I wanted to say thank you. These are just darling and I can’t wait to make them.